Alpha Anywhere already has client and server side reporting - also go to https://www.alphasoftware.com/video-library/ and type into the search box "reports" for videos on server-side reporting. Then go to this link for a tutorial on templating, which is how Alpha Anywhere lets you create client-side reports. Also check out this tutorial for the Template Tester which is built into Alpha Anywhere. An overview of client-side templating is here and take a look at the viewbox for more on client-side formatting. SQL Server Reporting Services - Using Reports Created in SQL Server Reporting Services in an Alpha Anywhere Project - Many organizations use SQL Server Reporting Services (SSRS) and have a number of reports that were developed in SSRS. Using these reports in an Alpha Anywhere application is now possible using the SSRS integration features in Alpha Anywhere. These steps are discussed in more detail below. 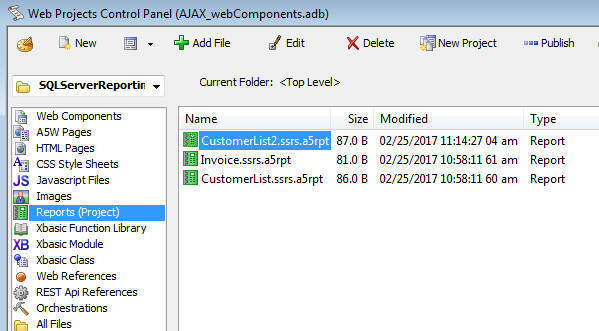 To create SSRS connection string, select the Tools menu when the Web Control Panel has focus and then select the SQL Server Reporting Services Connection strings menu item. To link SSRS reports in your Web Project, go to the Web Projects Control Panel and select the Reports category. 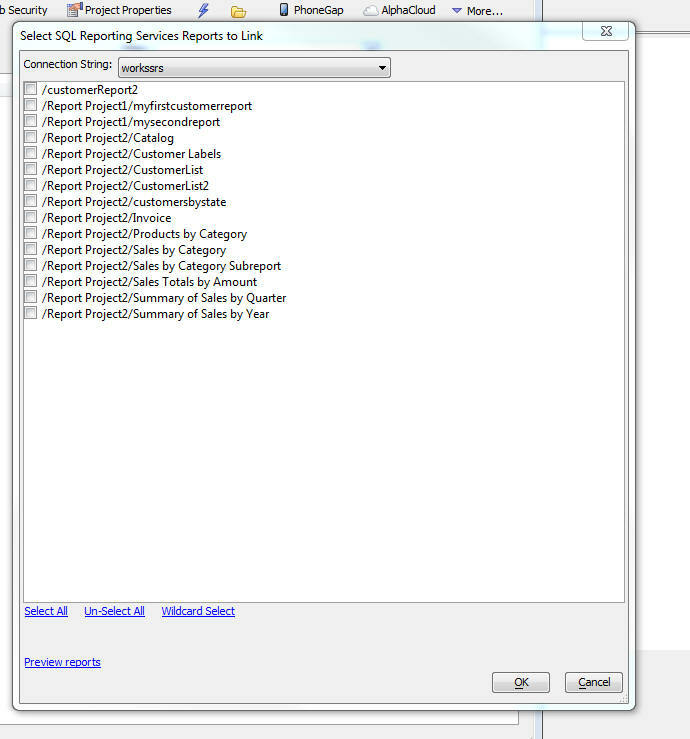 This will bring up a dialog where you can select the SSRS reports you want to link in your Alpha Anywhere project. 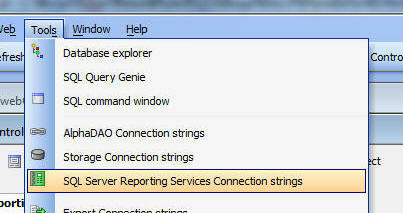 Select your SSRS connection string in the Connection String dropdown box. 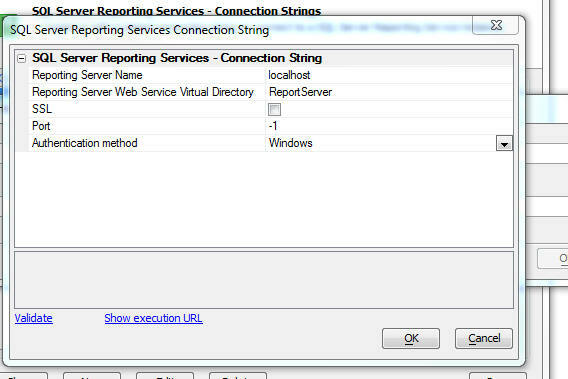 A list of reports defined in the selected SSRS server will be displayed. NOTE: The first time you connect to a SSRS server, it can take quite a long time before SSRS responds with the list of reports. Select as many of the listed reports as you want. Notice that at the bottom of the dialog there is a Preview Reports hyperlink that will allow you to preview any report before you select it. If the selected report uses parameters, you will be prompted for the parameter values. Links will be created for each of the selected reports. 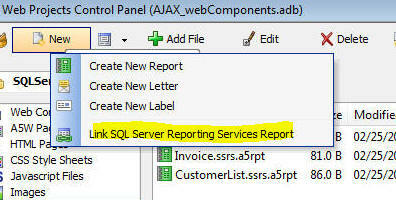 A link is a file in the Web Projects control panel with information about the SSRS report. The filename includes the .ssrs. string in the name just before the .a5rpt extension. When you define a publishing profile to publish your application you can specify values for your SSRS connection strings, just as you can for all other types of connection strings (e.g. AlphaDAO, storage, etc.). This means that you can connect to a different SSRS server when you publish your application compared to what you do when you are developing your application.